I was standing here with a stack of stickies, a marker, and bright coloured poster boards strewn across every conceivable surface strategizing the WomanNotWaiting.com vision. I was excited. I was driven. I was compelled to pour inspiration after inspiration onto yellow rectangles when I got distracted by a little quack (see The Ducks Are Quacking). My loyal fun-loving pooch caught her first waddler and since poodles are so fearsome and menacing, it didn’t take long for her catch to drop the little golden egg she had been incubating. Anyway, we had a foul worded war of the minds until thankfully Lola decided it was time to silence Wanda. (Whoops, I should have remembered to feed her I guess….no worries, this is a metaphor. No animals were actually harmed or starved in the writing of this blog). As Wanda’s feathers settled at my feet, my primal brain was drawn to an oval-shaped shiny object. When I leaned over to pick it up, it shuddered, so I pulled back, startled, waited for it to relax, then nabbed it. The poor thing was terrified. Lola had killed the messenger. There I stood, with an orphan in my right hand, harvested from the left side of my brain. It’s fate was doomed. I was not about to sit on it (click here), so I pulled out my blow dryer and plugged it in. It took a while, but the heat eventually cracked the shell revealing a miniature reproduction of a high school corridor, the cool gang lined up like a gauntlet. I stepped back in horror. Time stopped with the memory suspended half way between my hand and the floor. You see, the egg was scented and it stunk. The resurrected emotions of isolation and ridicule spewed their toxic fumes all over my creative space, and I felt nauseous. I remembered my parents telling me to ignore them. They weren’t going anywhere in life anyway, but I would. So I buried the labels and my self-worth along with them. And I waited. I became someone else, someone diminished, non-threatening, eager to please, a noble martyr who put everyone else’s needs ahead of her own. Let me tell you, there is nothing noble about being out of integrity with your life’s purpose. It was time to call upon the graceful warrior. That duck is plucked! YEEHAAA! Time to pluck YOUR duck. Send us some feathers from your flock. Wow! This one gave me chills! You write so vividly! Wow! Thanks again Nancy, I am hoping this one will inspire people to make some canard à l’orange (good for the chills) with the lame ducks they’ve been carrying with them. 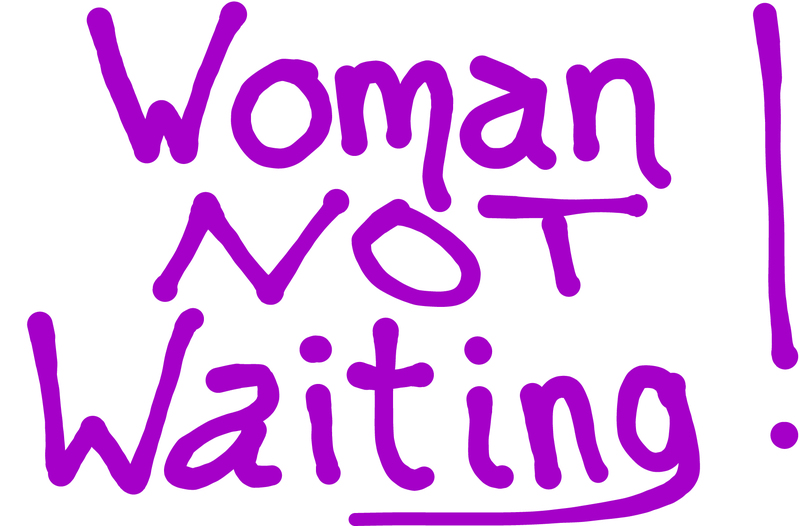 Not befitting of a Woman Not Waiting. It’s slows you down.